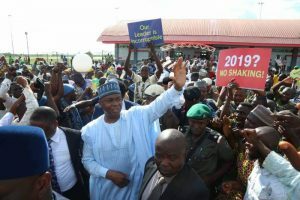 The Senate President, Dr. Abubakar Bukola Saraki was on Tuesday, accorded a heroic reception by a crowd of supporters and admirers that gathered at Ilorin International Airport to welcome him to Ilorin. This is coming ten days after the nation’s Supreme Court discharged and acquitted him of allegations of false assets declaration. Saraki’s supporters waited for his arrival for about eight hours, having assembled at the airport as early as 8.00am. Motorists and other road users had a hectic time on the Ilorin-Ogbomosho road, as Saraki’s supporters lined both sides of the road with vehicles stretching for kilometers. He was accompanied on the flight by the Speaker of the state’s house of Assembly, Dr. Ali Ahmad, Senator Rafiu Ibrahim, former Speaker of the state Assembly and chairman House Committee on Judiciary, Razak Atunwa as well as former presidential spokesman, Dr. Doyin Okupe. While taking questions from Journalists, Saraki described his three-year trial as tough but expressed satisfaction that his followers never doubted his innocence as he had told them on many occasions. But he declined comment on what he will do over pressure by some of his followers to lead them out of the All Progressives Congress (APC). He only asked Journalists not to ‘worry’ or ‘push’ him over the matter. “As I said, don’t worry, don’t push me, I will call at a time and I will tell Nigerians”, he said. On his trial and the visit he said: “It’s been a long journey for all my own people in the state, and today we thank the Almighty God for this. I want to thank all of them who did not at any time waver. They believe in my innocence and supported me throughout those three very tough years and it was a great feeling for all of us. “It is my first homecoming to thank them for all the support they have given me and the victory and for the fact that the truth prevailed and justice was done. Today is a day for me to visit and more importantly thank the people for the support they have given for years. The Senate President and his entourage drove directly from the airport to the Emir’s palace to pay a thank you visit to the Emir, Alh. Ibrahim Sulu- Gambari.